Carrie Fisher (1956-2016) was a good actress (“Star Wars” (1977) etc. ); an amusing biographical novelist (“Postcards from the Edge” (1987); and a great memoirist and humorist (“Wishful Drinking” (2007) and “The Princess Diarist” (2016)). Ms Fisher wasn’t as well known for her mental health advocacy. 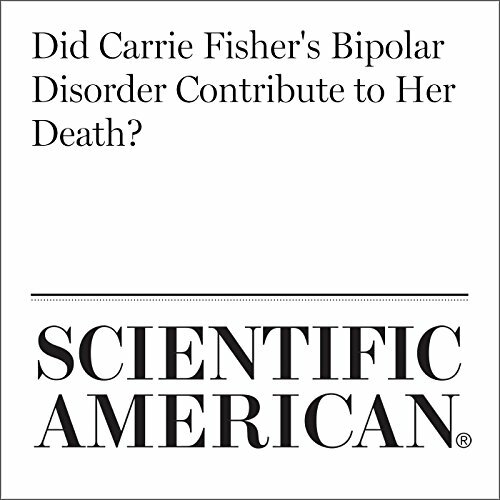 This Scientific American article, “Did Carrie Fisher’s Bipolar Disorder Contribute to her Death?” (2017) is a short, kind tribute to Ms. Fisher and discussion of the research into the biological and physiological abnormalities that studies have shown exist in people with the disorder. More studies are needed, but those seem to mean an earlier death, even aside from self-harm substance abuse. It’s a nice companion piece to Ms. Fisher’s autobiographical books. The title of the review is a quote of Ms. Fisher.